/ Because he is everything, the creator of everything." Location: National Gallery of Art, Washington D.C. 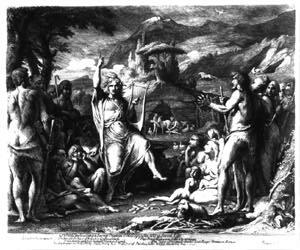 Size: 36 7/8" x 30 1/16"
Die Hochzeit von Orpheus und Eurydice steht unter schlechten Vorzeichen. 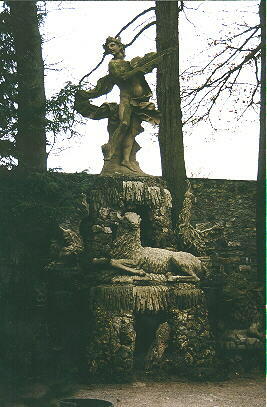 Die Baume und Tiere wandern zu Orpheus, um seinen Gesang zu horen. Orpheus' Weg in die Unterwelt, aus der er Eurydice zuruckholen will. Location: Palazzo Pitti, Galleria Palatina, Florence, Italy. He was born in Courtrai but studied in Amsterdam under Jacques Savery (died 1602), who was probably his brother. Around 1604 he entered the employment of Emperor Rudolf II and spent about eight years in Prague, where he became one of the emperor's favourite artists in the symbolic mannerist mode that Rudolf particularly liked. Savery specialized in precise depiction of animals, observing from life some of the more exotic species in the emperor's menagerie; he painted at least twenty variations on the theme of Orpheus and the animals, and his famous Paradise (National Gallery, Prague) is another example of his fantastic mйlanges of exotic and domestic birds and beasts. He also produced some fine mountain landscapes, the fruit of travels in the Alps and Tyrol (1606-08) at the emperor's behest. His exquisite flower paintings are among the earliest of their kind, although not so frequent in his prolific output. After working for Rudolf's successor, Matthias, in Vienna (1612-16), avery returned to the Netherlands and settled at Utrecht in 1619, where his fame and ability brought him many admirers and followers. Orpheus vertraut auf die Hilfe der Unterweltsgotter. Die Liebe sei ja auch der Grund fur die Verbindung von Pluto und Proserpina. 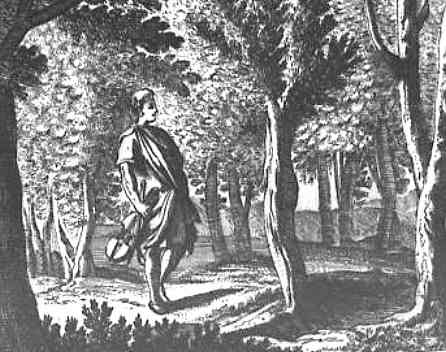 Orpheus erstarrt wie Olenus, der zusammen mit seiner hochmutigen Frau Lethaea zu Stein wurde. Zu Orpheus Gesang kommt auch die Zypresse, die einst ein Jungling war. Canova produced his first commissioned works - a pair of statues showing Orpheus and Eurydice - at the age of just 16 or 17, for his patron, Senator Falier. Placed side by side, they were intended as a group but could also be displayed separately. 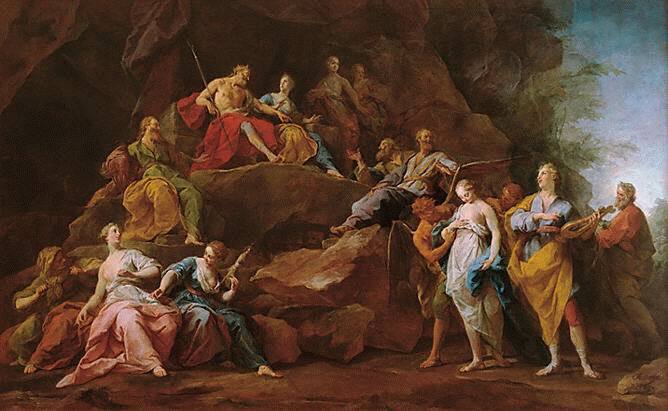 The Hermitage is an author's copy of the most successful of the two works, Orpheus. Canova chose to show the dramatic moment at which, feeling that Eurydice's soul is slipping away, Orpheus clasps his head in despair, not noticing that he has dropped his lyre and is trampling it beneath his feet. The choice of the most dramatic moment in the story, the tension and dynamism, the complex twist of the figure and the grimace on the face of Orpheus are evidence that the young sculptor was still influenced by the traditions of the late Baroque style. Location: Musee de Picardie, Amiens. Location: Ny Carlsberg Glyptotek, Copenhagen. 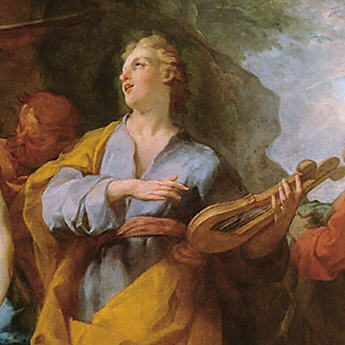 Vor Pluto und Proserpina tragt Orpheus singend seine Klage vor. Grand prix de Rome de peinture d'histoire, 1865. Paris, Ecole nationale superieure des Beaux-Arts. (c) Copyright Direction des musees de France, 1995. Cliche Ensb-a. 56 x 36 x 48 in. Eurydice sinkt zuruck in die Unterwelt. 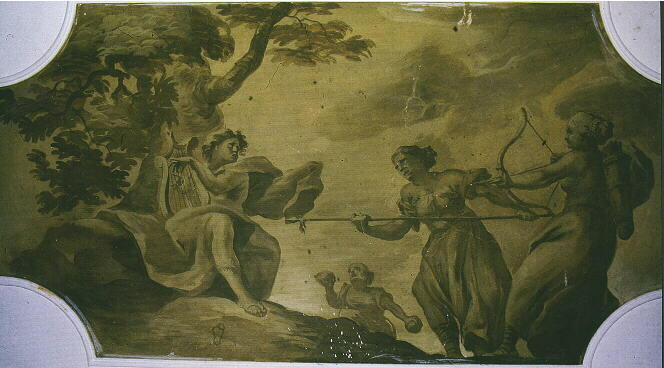 Study for "Nymphs finding the Head of Orpheus"
Dimensions: H.45-1/4 x W.65 in. About the painting: The leading figure in the procession shown in this painting, holding a lyre, is Orpheus. He is followed by the goddess Semele, who, tricked by the jealous Hera, demanded that her divine lover Zeus, the god of lightning, appear before her in his true form, whereupon she was consumed by fire. Behind Semele are Psyche and Cupid, and Sappho, the poet of Lesbos. Sappho is followed by Francis of Assisi, a monk who communicated with animals. 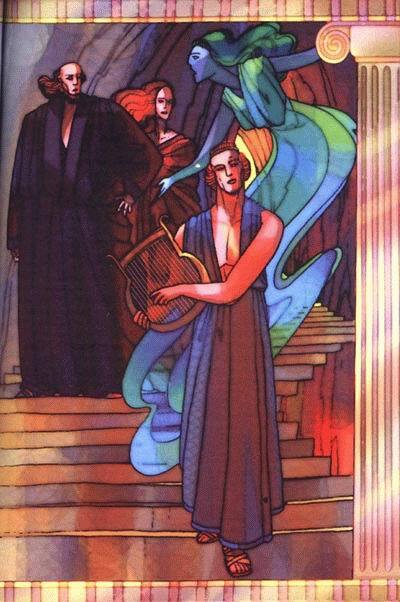 Following St Francis is Iseult, carrying the cup from which she and Tristan will drink. Next is Elaine (from Arthurian legend), who carries the shield of Lancelot, who spurns her love causing her to die of her grief. Following her is Hugh of Lincoln, the boy saint who died at the age on nine in 1255. Next come Aucassin and Nicolette, two lovers from 12th century French tales. Behind them is the poet Dante and above him his vision of Paulo and Francesco. Finally, Magia Santi completes the procession, holding the hand of her son Raphael who, with Michelangelo and Leonardo, was the youngest of the creators of the High Renaissance. In the background Alcestis is carried off to death (behind Semele), and Percival carries a stave as he rides in quest of the Holy Grail. A short-lived movement in French painting that developed out of Cubism between late 1911 and early 1914. The word 'Orphism', which had previously been used by the Symbolists, was applied to the movement by Guillaume Apollinaire at the exhibition of the Section d'Or in October 1912; the reference to Orpheus, the singer and poet of Greek mythology, reflected the desire of the artists involved to bring a new element of lyricism and colour into the austere intellectual Cubism of Picasso, Braque, and Gris. The painters mentioned by Apollinaire as practitioners of Orphism were Robert Delaunay, Fernand Lйger, Francis Picabia, and Marcel Duchamp; Frank Kupka was the main member of the movement not named by Apollinaire. They made colour the principal means of artistic expression and Delaunay and Kupka were among the first to paint totally non-representational pictures, seeing an analogy between pure abstraction and music. Although it was short-lived, Orphism had a strong influence on German painting (notably Klee, who visited Delaunay in 1912, Macke, and Marc) and also on Synchromism. Nur kurz soll das Gluck des jungen Paares dauern. Die Liebe zu seiner von einer Schlange getoteten Gattin ist der Grund. and 34 inches in height. Size: 76 x 51 inches.